Pets will have a similar reaction to that of an older sibling when a new baby is brought home. You will pay more attention to this new life, and trying to negotiate the waters of parenthood, and your dog will be confused about this change in routine. Here are a few ways to 'baby-proof' your dog before introducing them to the newest member of your family. Before your due date gets too close, take some time to refresh your dog's basic obedience skills. Your dog should be able to 'sit', 'stay', and 'wait', while also understanding a basic 'place' cue, which would send them to a specific spot (such s their bed). These cues will be very helpful in ensuring that your dog is not always underfoot, and can help with impulse control. You've probably done a ton of shopping for your new baby, but do you have the right equipment for your dog? You should have a fixed-length leash (4-6 feet), instead of a retractable leash, because you may need to tether your dog to a piece of furniture if his 'sit' and 'stay' needs work! Baby gates aren't necessary for your child right away, but your dog will benefit from having boundaries for a little while. A comfortable bed to act as a home base for you dog will hep the transition greatly, as will a variety of treat-dispensing toys. These toys can act as a babysitter to occupy your dog when you can't! Some dogs are frightened by the movement of stroller so take your time and introduce your dog to yours slowly. Set it up, let them smell it, and move it forward slowly. Drop some treats a few steps away from it so they begin to associate it with good things. Try taking a walk with your dog, giving him treats for walking nicely beside the stroller. If he seems scared, go back to the initial steps and start over. It's impossible to predict a newborn's daily patterns but you should do your best to mimic what you think your new schedule would be, to help your dog adjust to what will soon be happening. For example, if your dog gets fed and walked at the same time every day, try mixing it up a little bit so that a delayed meal or exercise wont be stressful for your dog. Finally, try not to smother him with extra love and attention to overcompensate for the future, as the shock to his system will be much greater afterwards. Dogs are naturally curious so it makes sense that he will try and get close to investigate this new person in his space. watch him and praise good behaviours, such as backing away when you ask him to and sitting nicely instead of jumping up to see the baby. Also, make sure that your dog's flea and tick medications are safe for close contact with newborns. If you have any questions concerning your dog and your new baby, your vet will be able to provide you with some great advice. Children that grow up around dogs form special bonds with their furry friends. 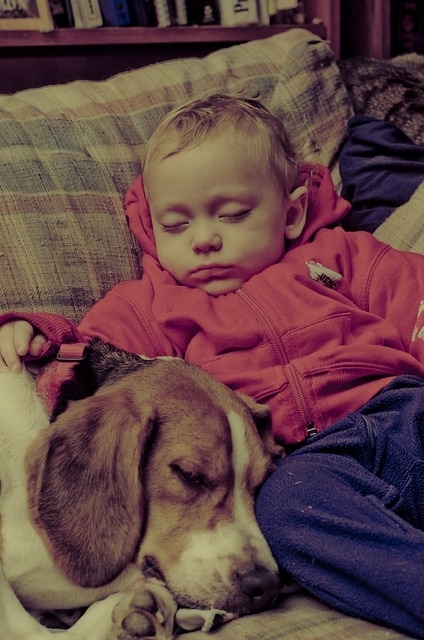 The initial adjustment to caring for both a baby and a dog can be challenging, but rewarding. Taking the appropriate steps from the beginning will make the process a lot less stressful.